Berlin, 07.02.2019 – The first |transkript issue of the new year is as bulky as it has not been for some time. The freshly printed magazine is full of topics that are currently causing a stir in the biotechnology sector. The cover story discusses immobilised enzymes and flow-through biocatalysts, which are gaining acceptance not only in chemical synthesis. A further background story deals with prenatal blood tests, which can detect risks for Down’s syndrome and other chromosome aberrations prenatally even without amniocentesis. In view of the upcoming broad application of the technology, a bioethical debate is in the making. In an interview, Friedrich von Bohlen, CEO of Molecular Health GmbH, explains how the Heidelberg-based company hopes to revolutionize the use of clinical trials with its Dataome database. 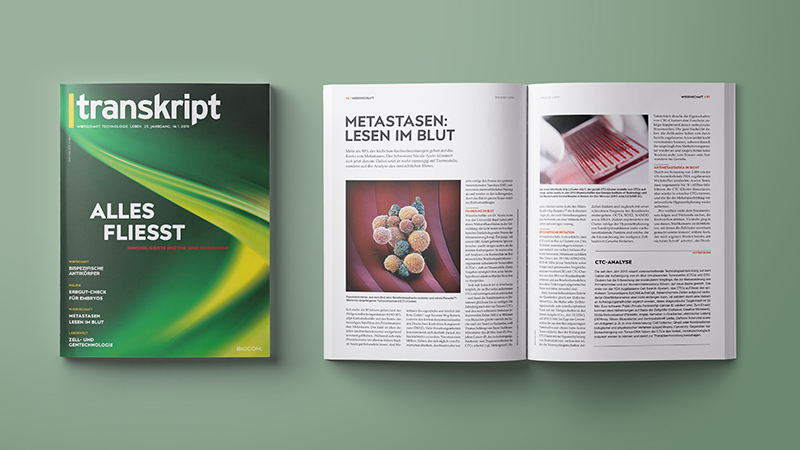 Other sections of the German-language magazine deal with the future market of bispecific antibodies, alternatives to conventional antibiotics and new approaches for metastatic cancers. The special deals with the Austrian life sciences sector, while the LABORWELT section deals with lab topics, this time focusing on cell and genetic engineering.